Tomorrow is Mother's Day, so HAPPY MOTHER'S DAY to everyone! 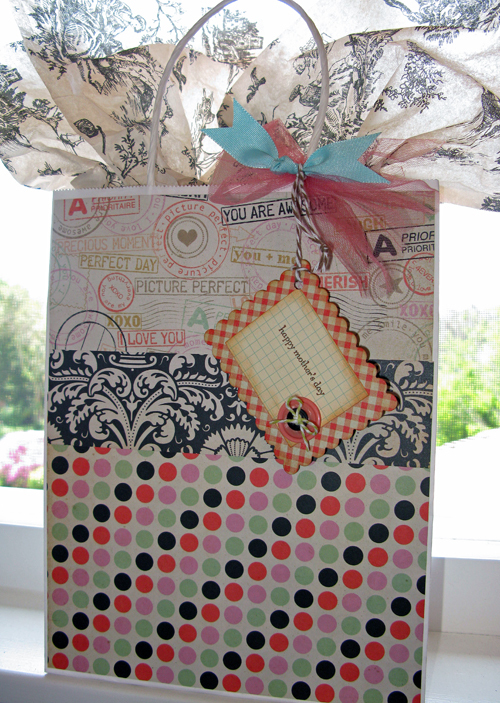 Out of necessity (because let's face it, we all have very busy lives) I've learned to whip up a coordinating gift bag and tag in a minute. It seems like such an obvious project, but I thought I'd share it with you and maybe save you in a pinch sometime. 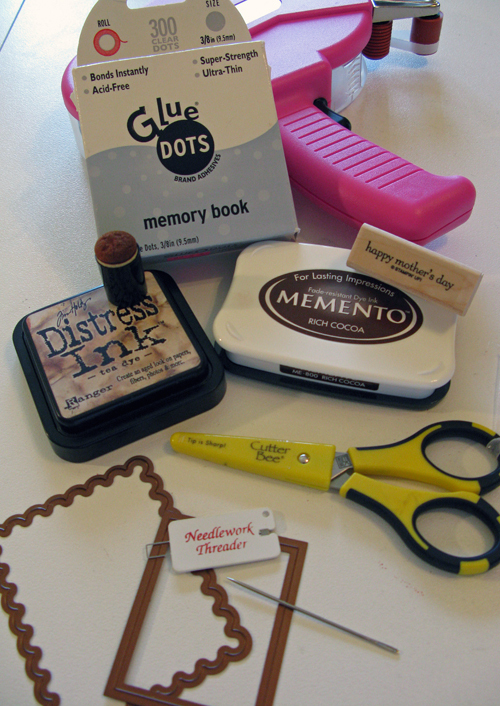 The basic tools you'll need include adhesive tape (I love my pink ATG), glue dots, paper snips, Distress Ink and sponge dauber, Nestabilities regular and scalloped rectangle dies, baker's twine, and some ink for my stamped sentiment. I use medium sized white handled paper bags as my base. They are generally 8" x 10". 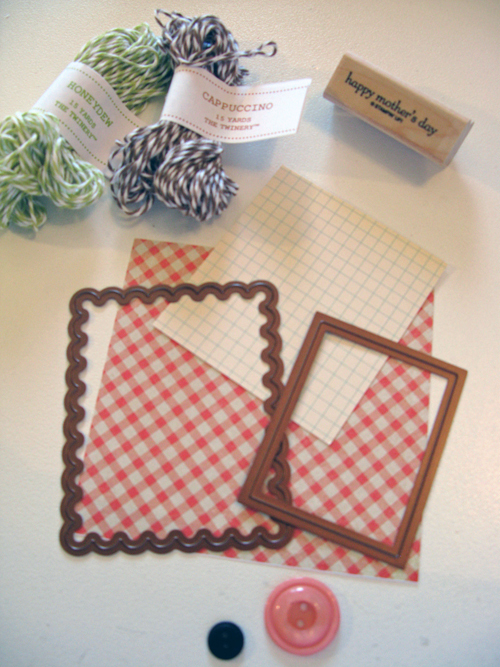 Cut three pieces of patterned paper: 4" x 7-7/8", 2" x 7-7/8" and 6" x 7-7/8". 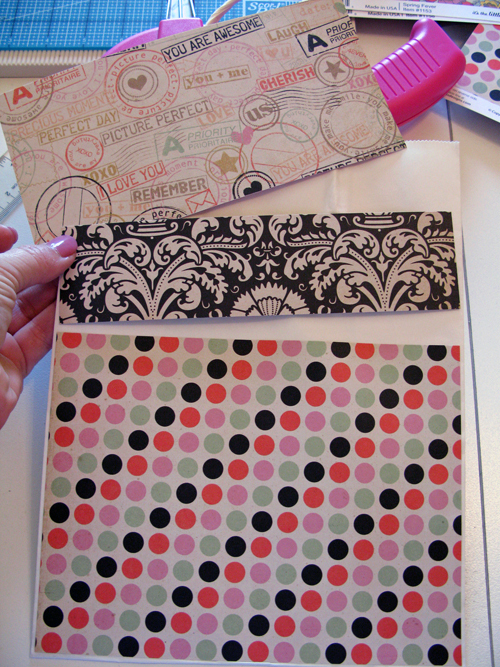 Using a double-sided piece of patterned paper makes coordinating your project easy -- kind of like Garanimals when you were a kid! Adhere the larger piece at the bottom, the medium piece at the top and the 2" piece center along the area where the other two pieces meet. For an added touch, before you adhere that last piece of 2" paper, wrap some ribbon around it, adhere the ends onto the back, and then adhere that strip to the bag. 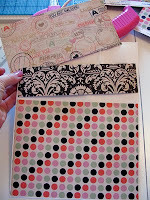 For the tag, I used a couple scraps from my patterned paper (great project for using paper scraps). I cut a scalloped rectangle from a "busy" piece of patterned paper and a smaller regular rectangle from a lighter, simpler piece. I used Distress Ink sponged onto the edges of both pieces, then stamped a sentiment onto the lighter piece and adhered it to the scalloped piece. Punch a hole in the top left corner for cappuccino baker's twine, which you'll use later to tie the tag to the bag's handle. For interest, I pulled some honeydew baker's twine through the buttons' holes and finished it into a bow. This holds the two buttons together. 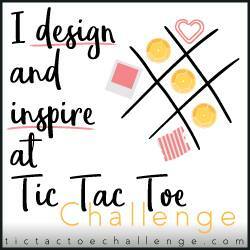 I then used a glue dot to adhere the buttons to the tag. 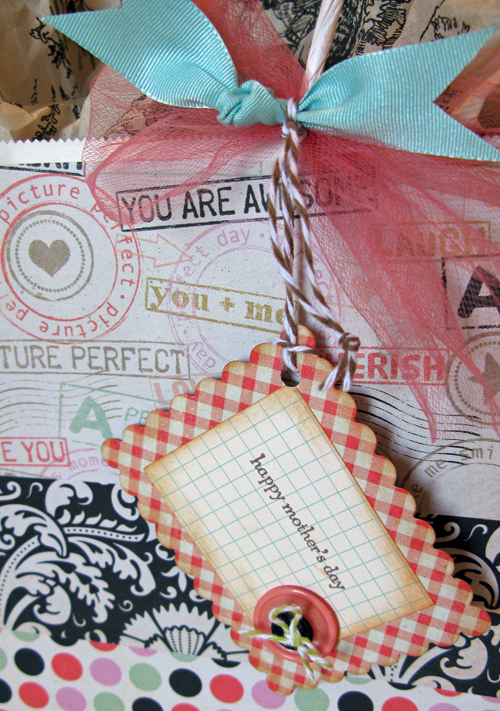 Add a couple coordinating ribbon scraps and tie, along with the finished tag, to the bag's handle. I just happened to have leftover toile printed tissue paper...perfect!